I am just back from London Fashion week and I truly loved every second of it all. I was backstage at some of the most incredible shows to include Rouland Mouret, Topshop, David Koma, Emilia Wickstead and Paul Costelloe and I was riveted by all the make up artists. When it comes to make up techniques whilst I appreciate 'Instagram makeup' and all of those steps and contours I will always be drawn to keeping things fresher and more minimal on my face. I like my make up to look like myself but just a bit more polished. That said a 'no make-up' look requires some technique and in my experience keeping things very clean between the lines is essential. There are a few products I keep on my dressing table and use every day whether I am doing a quick 10 minute job before I rush out the door, or taking a little longer for a night out. 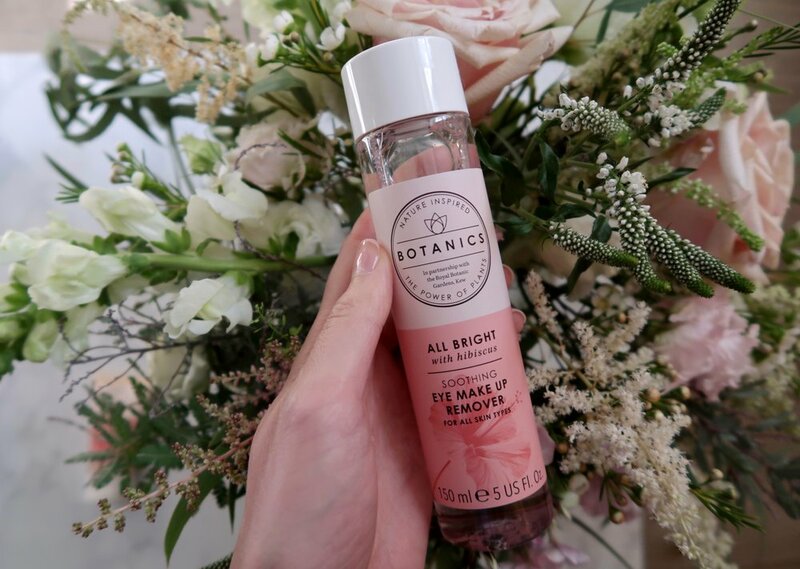 As a lover of all things naturally effective I am a big fan Botanics Skincare. The products I am chatting about here are all from the All Bright range which contain Hibiscus, the plant that make you glow. Hibiscus has skin brightening properties and is a natural radiance enhancer using exfoliating flower acids, found on the Hibiscus seed-pods. Sustainably sourced, the flowers are handpicked, creating jobs for those living in a co-operative in Burkina Faso, Western Africa. Range from €4.49 for the Wipes to €9.99 for the Radiance Balm they are accessible and effective. I always find no matter how well I cleanse my skin in the evening, in the morning there is always a teeny bit of eyeliner or mascara around my eyes. Mascara formulations nowadays are quite intense and whilst it's great that they don't budge throughout the day, they need really effective cleansing. A tiny bit of mascara under your eyes enhances shadows so running a Q-tip dipped in Botanics All Bright Eye Make Up Remover along my lash line and into the corner near the tear duct of my eyes is an essential step for bright eyes. I'm always amazed at how much comes off so definitely give it it try. What I love about this is not only is it cost-effective, it's also filled with natural extracts and soothing enough to use near the inner corner of my eyes. Initially I thought primers were a way of companies making you feel you needed to buy more and more products. That said now that I am a little older and also far more interested in make-up and product application, it's a step I don't leave out. I apply a little of this Botanics Radiance Balm, warmed between my hands, all over my face and neck. Even if I just have 30 seconds I try and massage it in and decrease tension around my eyes and forehead. I get a little furrow between my eyebrows when I've spent too long looking at my computer or phone screen and I find just taking a few moments to smooth out the area really helps reduce the line. This Radiance Balm is also light reflective and has a translucent pearl finish when you apply it. You could wear it alone but I feel it sets the scene for your base looking light and glowy. It's currently priced at €9.99 and you can get a second one for half price and the 50 ml will last you quite a long time depending on your usage. I also apply a little of it with a beauty blender onto my collar bones for a really natural looking highlight. My next tip is one I have learnt the hard way. Honestly I blame the videos where people just effortlessly glide liner across their eyes leaving perfect little flicks at the end. The easier someone makes it look, the more talented they are. My advice for applying eyeliner is: have your pencil well sharpened and also warmed up so it applies easily to avoid dragging it back and forth across your eye. With liquid eyeliner run the brush along the back of your hand to make sure there isn't any excess which will drip onto your eye area or smudge and lastly have a q-tip with a tiny bit of All Bright Eye Make Up Remover to hand to tidy up any mistakes. Lastly take your time. In the grand scheme of things taking an extra minute or two isn't going to see you delayed. I use the back of my left hand as a mini palette when I am applying make up. It warms the product and therefore it's easy when am mixing things to get the consistency I want. After applying my base I also leave a tiny bit of concealer on there to tidy things up at the end but most importantly when I apply things like eyeliner or use my fingers to smudge darker eye colours I always have All Bright facial wipes to hand to clean my fingers quickly and avoid any transfer somewhere I don't want it to go. Whilst wipes get very mixed reactions from the skincare community, that's only when they are used directly on your face. I just use these for my hands and not only do they effortlessly remove any product, they also don't leave my hands oily, or dehydrated. Definitely if you have ever made the mistake of smudging eyeshadow or gloss from your fingers somewhere you don't want it, these are a great thing to have on your dressing table to keep things clean and fresh and avoid any unwanted make up mistakes! I really hope you find these little tips helpful! Let me know if you've any more I should add to my routine? Follow #ThePlantOne online to see & share the love! *This post is created in collaboration with Boots Botanics.